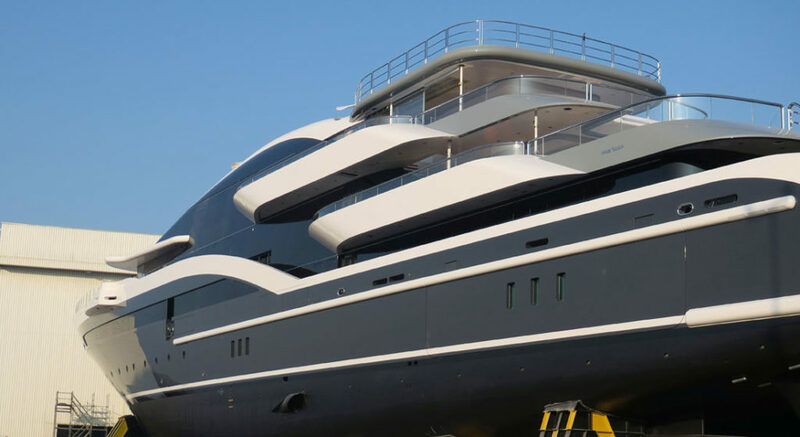 Sunny skies greeted the newest super-size superyacht from Oceanco earlier today. Project Shark, a.k.a. Oceanco Y717, emerged from her build shed. Striking in both her curves and color scheme, the yacht is a 295-footer (90-meter). She features styling by Luiz de Basto Designs, which has produced a few concepts for the Dutch builder thus far. In fact, the American-based studio created a strikingly similar-looking superyacht for Oceanco in 2011. Referred to back then as DP009 (with “DP” meaning “Design Project”), she was based on a technical platform created by the shipyard. 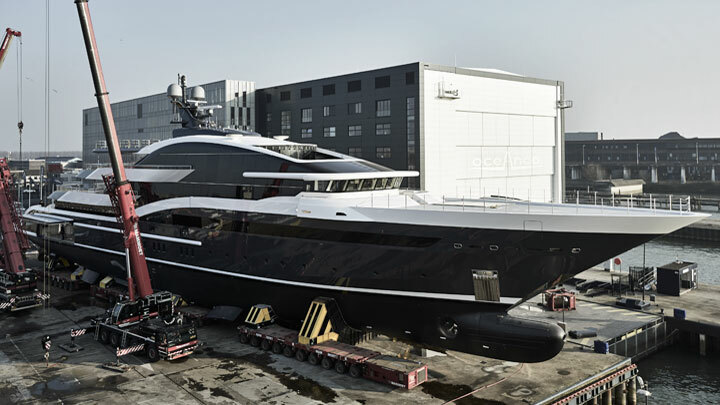 When construction began, and when Oceanco Y717 (as a raw hull and superstructure) came into view last fall, no one from the design or construction side publicly commented. However, given the nearly identical profile to DP009, the megayacht struck many yacht watchers as the inspiration. That led to the conclusion that she would have several of the same features. In comparing the concept design to the newly launched Project Shark, she does indeed. For instance, the color combination matches. Also, floor-to-ceiling glass runs along the main deck. This will make for a more enjoyable experience when underway, or at anchor. Speaking of enjoying the experience, the launch photos confirm two things. First, as the image at top shows, some sections of the aft decks jut out. They therefore serve much like balconies, for guests to use. Second, take a close look at the photo directly above. A recessed, glass-fronted area sits atop the wheelhouse, further with alfresco space. Surely, this is a private area for the owner and/or owner and guests to enjoy. DP009, by the way, called for a master suite in this location. While Oceanco did release the photo just above, and a few details, the facts are few. The shipyard will only say that Nuvolari-Lenard handled interior design. 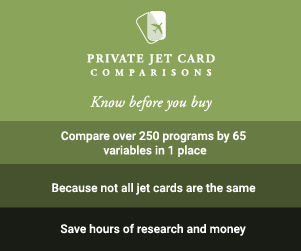 It has not specified the number of staterooms. (If Project Shark follows DP009, though, there’s a VIP suite on the bridge deck, plus four guest staterooms on the main deck.) The yard also revealed a beam of nearly 47 feet (14.2 meters). Power comes from a pair of 4,828-hp MTUs. Oceanco did not disclose anticipated performance, but it does say delivery occurs this summer. Oceanco says further information will follow. For now, in keeping with modern-day amenities, we believe it’s safe to surmise that Project Shark has a beach club, as well as a dedicated tender garage.